The whole stretch of Ayala Avenue, Paseo de Roxas and Makati Avenue lights up once again, bringing to life the spirit of Christmas. The Yuletide Season is in the air as Makati City welcomes the holidays with a traditional street lighting ceremony today, November 3, 2017. The beautiful twinkling lights depict colorful patterns that are inspired by the beautiful native hand woven fabrics from Luzon, Visayas and Mindanao, much-awaited celebration that will transform the premier business district into a Filipino Christmas haven. Paying tribute to the cultural heritage of the Philippines, Christmas symbols wrth inmate Filipino patterns from various regions lnabel and Burdado from Luzon, Banig Tikog from Visayas, T’Boli, Ukil and Yakan weaves from Mindanao will illuminate the streets of the central business district, creating a festive and harmonious atmosphere. 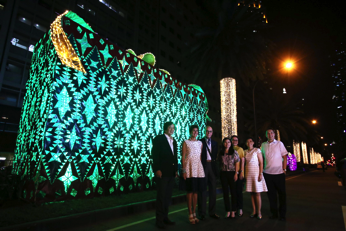 These patterns are applied to gigantic representations of Christmas symbols, transforming the streets of the city into truly Filipino Christmas landmarks. As the lights come alive, Makati’s wonderful streetlight decors will once again wrap everyone in the magical spirit of the season. This is the largest display of Christmas lights in the city and a well-loved Makati tradition that has brought the community together. This year's bright and energy efficient lights are courtesy of Firefly Lighting Corporation. Makati’s Christmas street lights continue to brighten up Christmas celebrations every year for everyone-from the thousands who work in the city to those who call the city home, as well as those who visit its various business, lifestyle, entertainment and cultural destinations. “Christmas is the highlight of the year for Filipinos, and we always want to make it special for everyone. By mounting an exquisite Christmas display. and through the Festival of Lights, we provide venues for people to enjoy the spirit of the season,” said Shiella Aguilar, Ayala Land Project Development Head for Makati. Indeed, no other city celebrates Christmas the way Makati does. Watch out on November 9, 2017, as the most anticipated "Festival of Lights" Christmas tradition unfolds at the Ayala Triangle Gardens. For more information about the city that makes it happen, visit www.makeitmakati.com and follow MakeltMakati on Facebook, Twitter, and lnstagram.